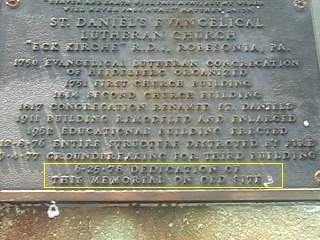 The 1998 recovery states the the church burned and was replaced on the same location. WRONG WRONG WRONG. 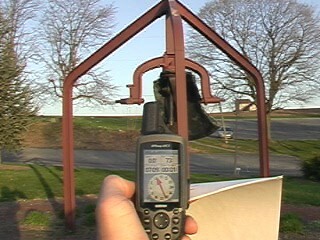 The coordinates pointed me to an odd bell hanging from a steel framework. The bell turned out to be half melted from the fire, and under the bell was a plaque stating that the bell was on the location of the OLD CHURCH. So obviously there could be no NEW church on this spot. The new church was visible from here but about 2/10 of a mile away. I expect this from USPSQD, but NOT from the USGS. I will be submitting a "destroyed" recovery to the NGS. The old bell, as seen from the coordintes for this station. The old bell, from behind. You might be able to see that it is half melted. It is a large, and old (half) bell. Plaque dedicating the memorial on the OLD SITE. 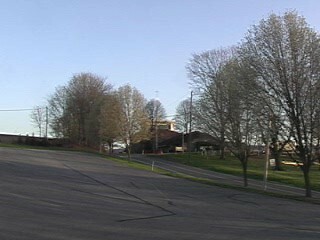 DESCRIBED BY COAST AND GEODETIC SURVEY 1942 (PLB) THIS INTERSECTION STATION IS THE ST. DANIELS LUTHERAN CHURCH LOCATED ABOUT 1 MILE N OF THE TOWN OF ROBESONIA ON THE SLOPE OF A ROUND TOP HILL AND IN A Y-INTERSECTION OF THE ROAD. THE STATION IS THE BASE OF THE GILDED CROSS AT THE APEX OF THE BELFRY. HEIGHT ABOUT 60 FEET. RECOVERY NOTE BY US GEOLOGICAL SURVEY 1998 (WCS) 20 MARCH 98 - RECOVERED IN GOOD CONDITION. NOTE- THE STEEPLE SIGHTED IN 1942 WAS REPLACED IN 1977 FOLLOWING A FIRE THAT DESTROYED IT AND THE CHURCH SANCTUARY. NEW BUILDING AND STEEPLE ARE ON THE SAME SITE AS IN 1942. RECOVERY NOTE BY US POWER SQUADRON 1999 RECOVERED IN GOOD CONDITION.